The English and French Wikipedias are the world’s first and third largest versions of the encyclopedia (containing 3.9 and 1.3 million articles respectively). I thought that it might be instructive to compare the geographic coverage of the two. Even though there is three times as much content in English than French, one might assume that there are plenty of parts of the world in which people are more likely to annotate or augment space with French content. We ultimately see only a few countries in which there is more French content: France (of course), Belgium, Luxembourg, the Francophone parts of the Maghreb (Algeria, Morocco, and Tunisia), the DRC, Senegal, and surprisingly Bosnia, Montenegro, and Kosovo. You would expect the first eight countries on the list to have more French content than English, but there seems to be no obvious reason why Bosnia, Montenegro, and Kosovo have more French-language information about them. Then again, there is not necessarily a reason why there should be more English-language content in every other country in which neither French nor English is the primary language spoken. 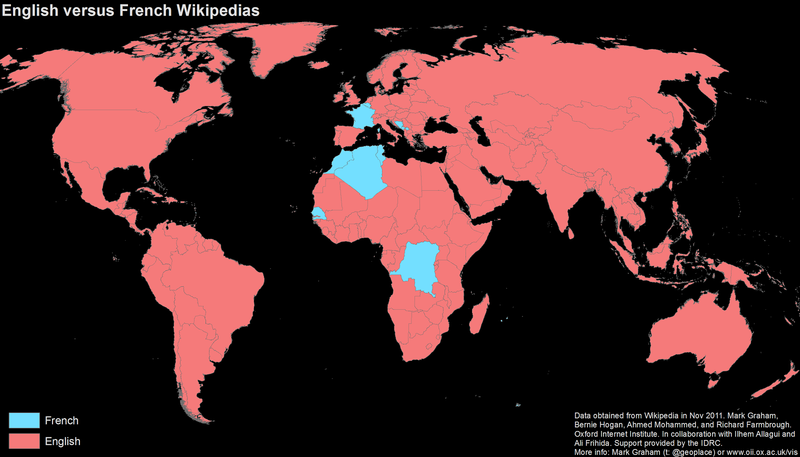 Also interesting is that much of the rest of the Francophone world has more English-language content then French. Madagascar, Haiti, Cameroon, Mali etc. all have more written about them in English than French. What does this map tell us? We know that the number of Wikipedia articles about a place isn’t necessarily a great proxy for broader social or cultural relationships and patterns (e.g. the example of the heavy focus on Turkey in the Swahili Wikipedia). But perhaps these patterns of attention do still tell us something about the importance of English vs. French in some of these places. Rwanda, for instance, has more English-language content: a fact that reflects the country’s shift into the Anglophone sphere. Perhaps in much of the rest of the Francophone world we are also seeing a similar (although likely less-pronounced) shift towards use of English as a means of non-local communication and local representation to a broader audience. I’d welcome any further thoughts or questions….